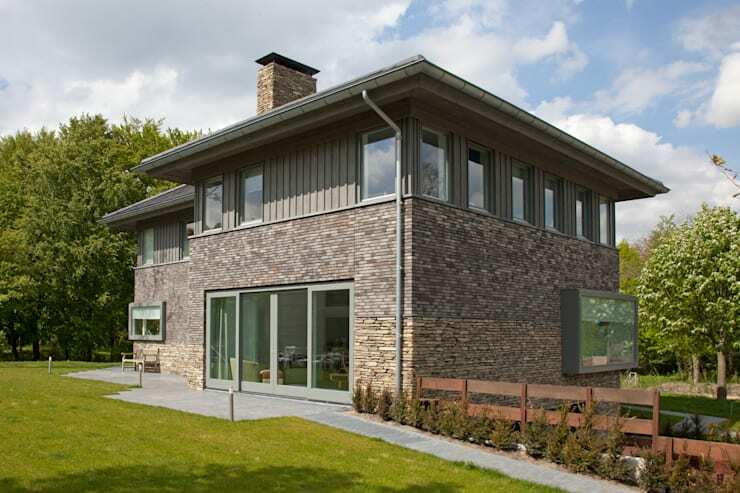 In Bloemendaal, a municipality in Netherlands, we came across a stunning villa which is modern yet rustic on the outside. On the inside though, spotless white walls and light-hued wooden elements make a bright and soothing statement. Equipped with multiple glass windows, this house receives tons of sunlight and looks inviting as well. Fuss-free designs and minimal furnishing are the other notable aspects of this property. 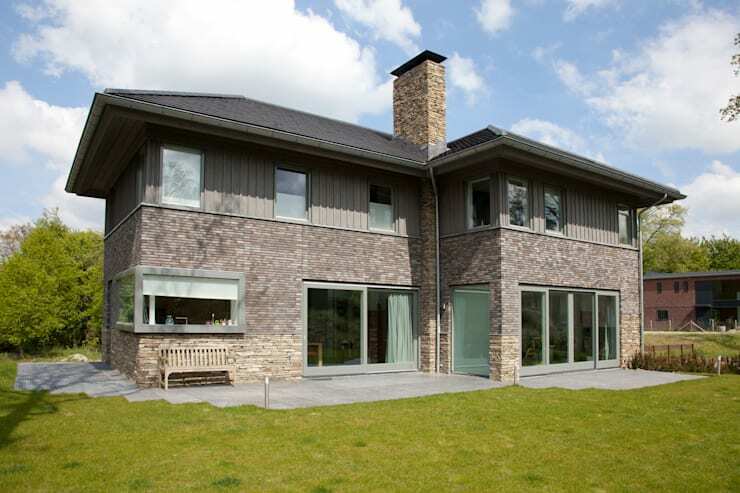 And all of this is brought to you by the architects at Archstudio Architecten | Villa's En Interieur. Clad in different shades of stone and concrete bricks, the sprawling house looks charmingly rustic and elegant. Surrounded by a lush green lawn, it promises true countryside bliss. Large sliding glass doors help in integrating the interiors with nature and also keep the home bright and cheerful. The slope of the roof is a quaint touch. The architects explain they wanted to create a clear distinction between the lower and upper floors by using stone, brick and wood siding, in a colour scheme that was harmonious with the surrounding environment. 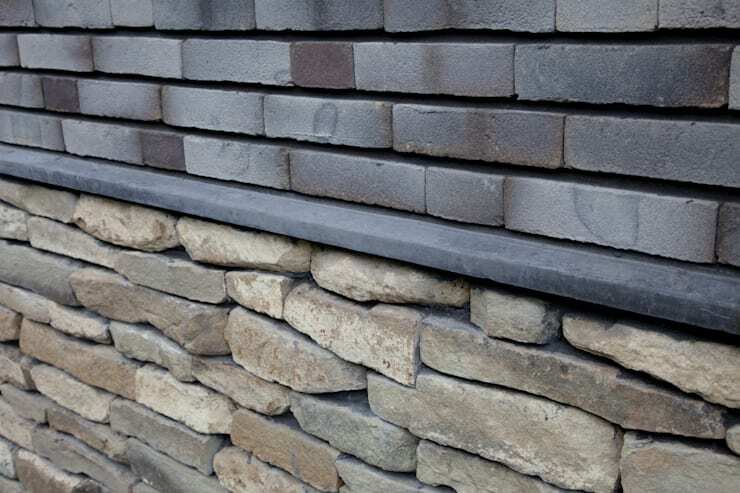 The neat juxtaposition of stones and concrete bricks is truly fascinating. This lends a whole new character and uniqueness to the exterior walls. The chirpy red and orange chairs add lots of life and spice to the white kitchen. Glass windows flood the space with sunlight and offer refreshing views of nature. The kitchen counter and island are sleek affairs, while the chandelier is very trendy. 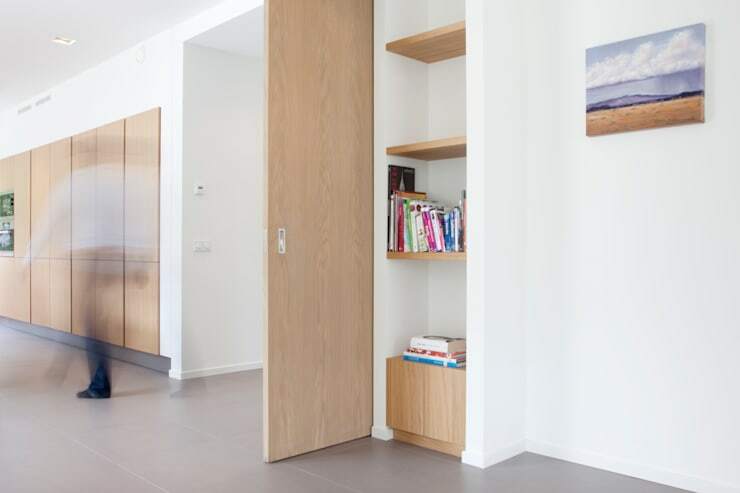 In-built wooden closets abound in this villa to store things in a neat and modern way. They don’t eat up floor space, but add warmth to the white walls. 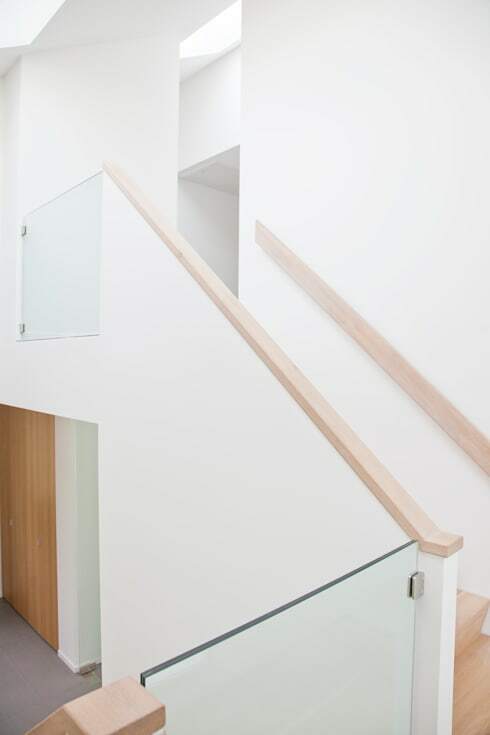 We love how white concrete and glass panels alternate to create the chic balustrades of the staircase. 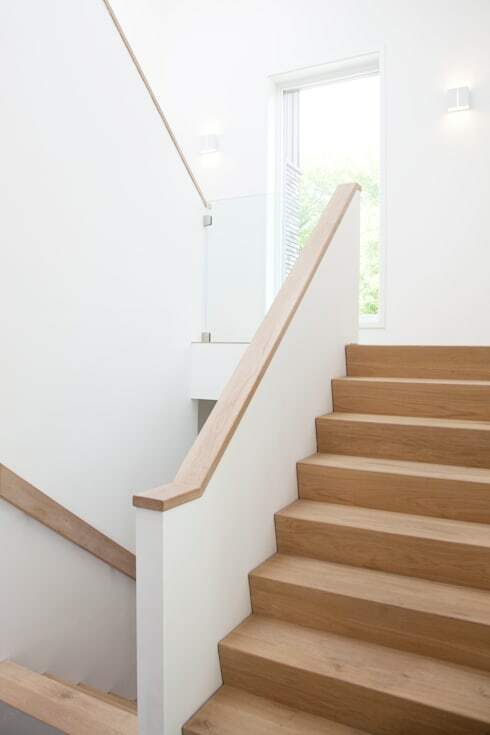 Paired with sleek wooden lines, the staircase looks stylish and unique. Also, the glass panels allow a sense of openness between the two floors of the house. 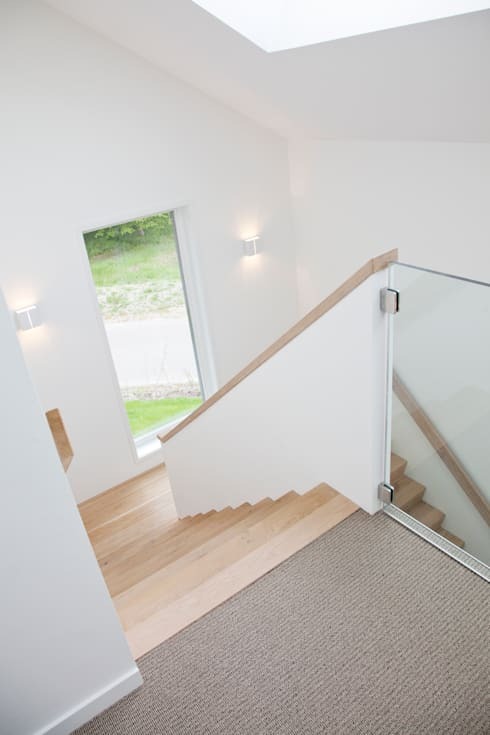 A tall glass window at the landing helps the wood and white staircase to stay naturally illuminated throughout the day. The smart wall sconces flanking it help too. Minimalistic decor, abundant use of white, smart storage and intelligent mix of materials make this villa a refreshing and cosy place to enjoy country life. The colour and style contrast between the insides and outsides is very appealing too. Take another tour here - A seamlessly simple yet beautiful family home.